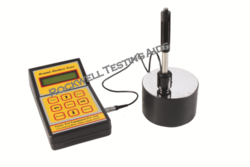 We are a leading Exporter of digital portable hardness tester from New Delhi, India. In stores for material identification. Measurement of Hardness in confined spaces. Variation in hardness over large work piece. Surface hardened component or hardness on coatings. Sleek and handy design comes in a slim briefcase, for carrying the machine. Alpha numeric display which indicates selected material & scale combination & hardness valve. Average key to select average of 2 to 10 readings. Machine is having improved electronics with micro controller circuitry & user friendly software. 30 hardness scales for different probes selectable by feather touch keys (Pls. ref. the table). Auto detection of probe facility is given. Automatic shut down facility is provided when machine is not in use for continuously 10 minutes. This model operates on 2 numbers of pencil cells. Printing is possible with all types of ports i.e. Dot matrix (Centronic parallel port). Up to 999 readings can be stored in memory of the machine for printing purpose (This Facility is useful when operating the machine at site). Conversion of UTS facility is available on display by using side keys(←). This is applicable for only BHN scale for the range 226 to 634 BHN (hard steel & hard alloys only). Display last result (For eg. From Sr. No. 20 onward) facility is given by using upper arrow key (↑) & down arrow key (↓). Also we can scroll through stored readings. The ON/Off switch is provided with feather touch keyboard on front side. In this model both serial & printer interfaces are available on single port (serial interface is an extra accessory). Automatic calibration facility of probe is available through keyboard. Serial interface is possible with Rs. 232. Date entry & date wise printout facility is available. We can recall the readings one by one by using arrow key (↑) (↓) on display, in display result mode. Backlight ON/ OFF facility is given by using arrow key (↑) (→) through keyboard.